Today you’ll hear the sad story of someone stuck at IELTS band score 6. You’ll find out what you need to change if this is your situation. What is this student doing wrong? She is trying to study alone, with a textbook and is trying to memorize things to prepare for IELTS just like she studied in her home country growing up. This doesn’t work when it comes to a language exam like IELTS. The IELTS requires spontaneity so memorization doesn’t help very much. She makes pages of lists of sentences and words by herself. She doesn’t interact with anyone else or any other material or input. She reads example essays and copies them. She doesn’t spend much time writing her own essays and using IELTS writing strategies. She refuses to admit that her way of studying isn’t working. She has been stuck at a 5.5 or 6 for three years. 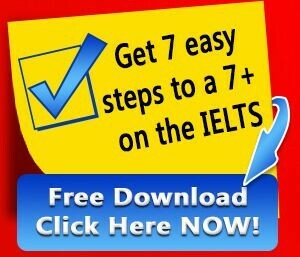 Do you know what steps to take to get a 7 or higher on the IELTS? You can get our free IELTS Cheat Sheet now! Admit that you need help and that what you are doing isn’t working. Be willing to change your preparation strategy. Talk to an IELTS professional that you can trust. Put in the hours with the CORRECT strategies. Go out into the real world with your English to get the balanced practice. Be willing to spend time with native speakers, make mistakes, and feel vulnerable. Remember that test practice is not a way to improve your IELTS skills. You need to prepare for the test by learning strategies and improving your skills then measure by taking practice tests. Are you stuck at a band score of 6? What are you going to change starting today?